Queensland Ballet has announced its 2016 season, and it looks like an absolute cracker. With traditional favourites and brand new creations, it’s going to be an inspirational, colourful and, at times, poignant year. Principal Dancer Clare Morehen in Queensland Ballet’s ‘Midsummer Nights Dream’. Photo by Simon Lekias. A co-production with the Royal New Zealand Ballet, A Midsummer Night’s Dream is choreographed by Liam Scarlett and comes to QPAC’s Playhouse theatre in April. Shakespeare’s classic has been enthusiastically received across the ditch, and we can’t wait to see this enchanting production here in Australia. Also on the programme is Derek Deane’s Strictly Gershwin, a spectacular tribute to the big band era. Combining ballet with swing and tap and set to unforgettable tunes such as I Got Rhythm and Rhapsody in Blue, this promises to be a night of glamour, romance and nostalgia. Strictly Gershwin plays at the Lyric Theatre from 27 May to 4 June, and is accompanied by a live jazz orchestra and special guests. From 29 July to 6 August, we pause to commemorate the centenary of the First World War and honour the Anzac legacy. Lest We Forget – supported by the Australian Government’s Anzac Centenary Arts and Culture Fund – is a triple bill reflecting on the impact of war. It includes Paul Taylor’s Company B, and new works from Ma Cong (In The Best Moments) and Natalie Weir (We Who Are Left). Soloists Shane Wuerthner and Lisa Edwards of Queensland Ballet in ‘Strictly Gershwin’. Photo by Simon Lekias. In February and September, look forward to the return of Dance Dialogues, a series of intimate studio performances. These sessions will include works by company dancers and established choreographers, Q&A sessions and the chance to view rehearsals. As a special Christmas gift, Ben Stevenson’s The Nutcracker will also make a return appearance. “This ballet has already become a firm festive favourite, and we’re so delighted that audiences have made us a part of their Christmas celebrations,” says Cunxin. My First Ballet will premiere in June with Little Red Riding Hood, combining ballet and puppetry in a charming production at the Playhouse. 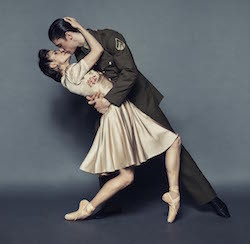 Laura Hidalgo and Vito Bernasconi in Queensland Ballet’s ‘Lest We Forget’. Photo by Simon Lekias. Cunxin adds that, during his time as artistic director, Queensland Ballet has grown in a number of ways, from its wide and varied audience to its high standard of dancers. Old-world style, history, myth, beauty, exploration and education… Queensland Ballet has something for everyone in store next year. Season tickets are on sale now, and are the best way to see ballet in 2016. A season ticket allows you choose two or more productions, save up to 30 percent on regular tickets, have access to priority booking, and receive invitations to private information evenings. For more, head to www.queenslandballet.com.au. Photo (top): Dance Dialogues from Queensland Ballet. Photo by Simon Lekias.